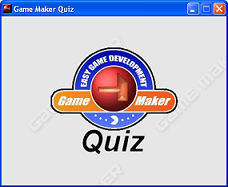 I'm glad to announce here the Game Maker Quiz. 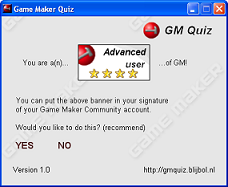 It's a test consisting of 30 questions about Game Maker, and at its end you're able to put a nice banner in your signature. (like my sig ). There have been more than 20.000 downloads (attempts to download) in total. IT DOESNT MATTER how long you used Gamemaker. You can still be a n00b even if you use it from Animo. Edited by Blijbol, 10 August 2009 - 04:46 PM. It's pretty good. I am da xperienced. Edited by Sektor_Z, 21 June 2005 - 02:19 PM. This doesnt seem like a stolen idea, right? It's pretty difficult to find nice questions for the test. Currently the program picks 30 questions out of 40 in it's database. But if you know some more nice questions, please pm me and I'll add them to the database . Edited by Blijbol, 19 June 2005 - 04:51 PM. Okay, okay, I'll edit the questions. Some of those questions are quite ambiguous. Ah, yes, and I highly doubt knowing what Mark's hobbies are make anyone an advanced user. WHAT?! I've been doing this for almost a year and I never even use the action tabs. I make games using scripts and pieces of code. Tell me I'm a "new user." Edited by Robert891, 19 June 2005 - 05:36 PM. Unexpected error while running game. That came in the version with music. The no-music version worked. Im agreeing with Robert891, i aint no stupid n00b like it says..
Edited by Heavendragon, 19 June 2005 - 05:49 PM. The questions are kinda not releated to GM (some of them). Should I know what Mark likes to do, to be experienced? Or stuff about the gmc? Its a nice test, but more boring than the gm noob-test, and I like funny stuff more than serious. It seems to be that people with a high score in the gm n00b test have a low score in the gm quiz and people with a low score in the gm n00b test have a high score in the gm quiz. I'm uploading a new version now with 20 new code-related questions, hopefully that will do the trick. Edited by Blijbol, 19 June 2005 - 06:02 PM. Great program! But I don't like the results. I'm a novice? I've been using GameMaker since 2000, and I never use D&D, and I am a freaking novice? Let me ask you, have you memorized how many deactivating functions there are? Or what programs Mark Overmars made or what he likes to do in his spare time? This doesn't seem to be testing GM knowledge at all, just whether we are stalkers or not. The program was smoothly executed, but the questions weren't too accurate to skill with GM. Good job with the program. Bad job with the questions. Edited by Obsidian, 19 June 2005 - 07:00 PM. am not new I'v made games for 1 1/2 years and I can make games completly from code. So... I will lower the requirements of the ranks. Remember, suggestions for new questions are always welcome! It said I'm a novice. I'm not a novice! As people have said before, these questions aren't very accurate. Who cares what Mark likes doing in his spare time? The question of why people still use 5.3a is based on opinion, not fact. Who actually memorizes how many different functions deal with certain things? questions, almost all of them. Edited by MetalGearSnake, 19 June 2005 - 08:02 PM. 1) who cares how many banners on the GM website? 2) who cares what forum software we are using? 3) who cares what mark does in his spare time? Jebo, hard test... really hard. It says Im novice. Who gave Blijbol, or the creators of the GM n00b Test, the rights to tell us how good we are with Game Maker? It's like when people make "i'll rate ur name" or "ill rate ur siggy!!!!!" threads. Don't feel offended if you get a low rank, since what this quiz gives you doesn't have to mean anything. Oh, and if you notice, Blijbol has a four star ranking, that's the highest I think. Edited by gakon5, 19 June 2005 - 08:44 PM. this is pretty pointless, please add about like 60 more questions and make them on usefull stuff... I mean who cares how many reggistered members there are? or who created gamemaker? 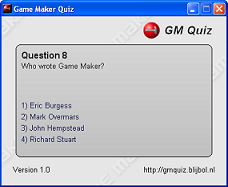 so far what i'v seen... this quiz is about how much you know about gamemaker and it's history, and not using it. Edited by kross 7, 19 June 2005 - 09:04 PM. It said that I am a Novice user. But I did it drunken. (wine) I will do it again when sober, because I am really not a novice user. Edited by Kaleta, 19 June 2005 - 09:08 PM. I really hated it. It do not test your programming abilities, it test if you studied the lest usefull things of GM. How would i know the number of functions dealing with Dll's? I give you a 7/10 because its a quiz, but you would have 10 out of 10 if it was about programming. Everyone agrees with me but noone said "As sektor said..." or something. Damn! By the way you can keep updating this with harder questions, and call it "GM experienced test"
Edited by Sektor_Z, 19 June 2005 - 10:27 PM. Don't feel offended if you get a low rank, since what this quiz gives you doesn't have to mean anything. I am a new user in the GM Quiz! I am a novice user in the GM Quiz! I am an experienced user in the GM Quiz! I don't think you can call yourself an advanced/expert user of GM if you don't even know who wrote Game Maker. But I will remove some questions about the community. Please, if you say a question is bad, make a suggestion for a question to replace it with! Edited by Blijbol, 20 June 2005 - 09:57 AM. Please do the test again when everybody finally likes the questions. Although, I guess you aren't an experienced coder, are you? There are currently some hard questions about GML at the moment. Edited by Blijbol, 20 June 2005 - 08:59 AM. Blijbol, the n00b test isn't serious as this one, even though it asks about GML. I am a in the GM Quiz 1.1! I think the "what is the number of the ****** functions" questions aren't really a good idea.. I mean, I could know all of the functions, but may forget to count one. I removed some of those questions in version 1.2, which I am now going to upload... But thanks for your comment! Did you use version 1.1 or 1.2? In version 1.2 it's almost impossible to get that rank. Edited by scorpius, 20 June 2005 - 10:29 AM. I removed the no music version, now there is one version with music because RichardGamezzz reduced the file size of the mp3 for me. Thanks RichardGamezzz! Downloading is now more than twice as fast!!! Edited by Blijbol, 20 June 2005 - 01:53 PM. Did you use Dance Ejay for the music ? What would be nice for questions would be that you give us a piece of code and we answer what it does or if it works, or e.g. what piece of code will do this, etc. I don't understand you. Could you explain what you are meaning? I am a novice.I don't really like the results but who cares. Classic card game made addicting.